Type set larger than 14 point is usually considered to be “display” type, whether it appears on a billboard or poster, a book jacket or other packaging, or an advertisement in a magazine. Also known as headline type, its objective is to attract and hold a viewer’s attention. Display type can also preview the mood or set the tone of a piece. Display typefaces can sacrifice a bit of legibility in favor of more distinctive or expressive details. 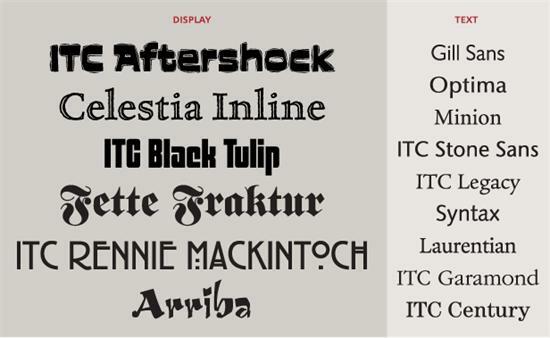 Text typefaces, designed to be legible and readable at small sizes, tend to be more “neutral” in tone. Selecting an appropriate display typeface can be challenging, as thousands of display fonts are available today. Additionally, current technology makes it possible to set any typeface at any size, regardless of the intended use of the original design. By contrast, earlier printing methods used wood or lead type which was cut or cast only in the intended size range. Univers is designed to work well for both text and display, as shown in the example above. What exactly is the difference between a text and a display typeface? Simply put, text type is designed to be legible and readable at small sizes. This usually involves fairly clean, consistent, uncomplicated design features, and thin strokes that hold up at smaller sizes. Generally speaking, the letter spacing of text type is more open than that of a display face, Display type, on the other hand, can forgo the extreme legibility and readability needed for long blocks of text at small sizes in favor of a stronger voice, more elaborate and expressive shapes, and a more distinctive look. These two versions of ITC Bodoni were designed to work well together, yet to be used for different size ranges. The Twelve, intended for text usage, has heavier serifs and thin strokes, wider character bodies, and more open letter spacing than the Seventy-Two, which is intended for display. 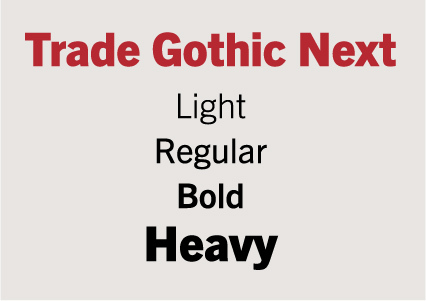 The lighter weights of Trade Gothic Next can be used for text as well as display. The Heavy should be reserved for display use, due to its tighter spacing and small counters that will fill in at small sizes. Keep in mind that while most traditional text typefaces (such as Caslon and Garamond), as well as more recent faces primarily intended for text setting (such as Cachet and Felbridge Pro), have been designed to perform well above 14 point, such typefaces usually do not make the best display faces. Knowing the demographics of your intended audience in addition to understanding the design brief will help you select a type design that performs well at the size range you intend to use.